Magnetic resonance imaging (MRI) of the abdomen; drawing shows the patient on a table that slides into the MRI machine, which takes pictures of the inside of the body. The pad on the patient's abdomen helps make the pictures clearer. Magnetic resonance imaging (MRI) of the abdomen. 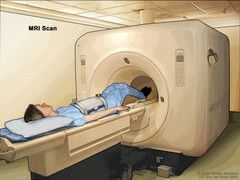 The patient lies on a table that slides into the MRI machine, which takes pictures of the inside of the body. The pad on the patient's abdomen helps make the pictures clearer.